Welcome to Kraków and to the 15th International Congress of the EuGMS! While the success of the 14th EuGMS congress in Berlin is still in our memory, we have already started the preparation of the next congress to be held in the beautiful and historic Polish city of Kraków from the 25th to the 27th September 2019. Together with colleagues from the local organizing committee led by Tomasz Grodzicki, Jerzy Gasowski and Karolina Piotrowicz, the Academic Board is preparing a varied and attractive program with the theme Evidence Based Medicine in Geriatrics. The scope is broad and fascinating with something for everybody - clinicians, clinical scientists, trainees, educationalists and health service researchers. Moreover, the program will highlight the state-of-the-art clinical practices, recent advances, new data and views from different stakeholders, in a format designed to encourage interactions. Our recently restructured special interest and task and finish groups will again have the opportunity to present and disseminate their recent results. 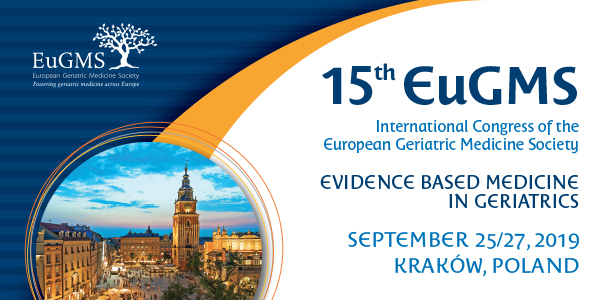 The Kraków congress will offer a unique opportunity for spreading geriatric expertise and attitude across central Europe and in particular those countries where geriatric medicine is still emerging thereby accomplishing one of the objectives of our Global Europe Initiative. Get thinking about abstracts. Check the Congress website, www.eugms.org/2019.html. Think about submitting a symposium, an opportunity to team up with colleagues from other countries to present and learn from each other. Do it soon as the deadline for this is March 1st. To promote attendance from younger colleagues and those on low incomes, we have a number of competitive grants and we have changed our registration fees radically to make it more accessible for participants from lower income countries. With best wishes for the new year, we look forward to meeting colleagues and friends, new and old, in Kraków on September 25th to 27th.